In Florence, of course, it is a given that everyone goes to see The Duomo and Santa Croce (where Michelangelo, Galileo and almost everyone who was anyone was entombed). Santa Maria Novella is often bypassed; because it is close to the main railway station of the same name, it's a bit on the seedy side. 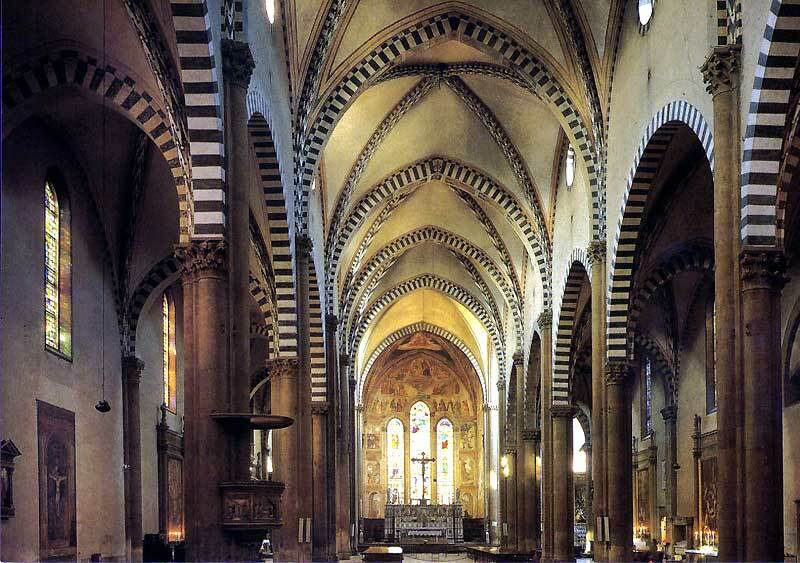 Florence back then is all about the powerful and the ridiculously rich families; they have financed this first great basilica to house their family's funerary chapels. It is amazingly chock-full of frescoes by the masters of the Gothic and the Renaissance (such as Ghirlandaio, Michelangelo's teacher) era. The Holy Trinity by Massacio or "Trinita"
"The first great painter of the Italian Renaissance, whose application of scientific perspective and depiction of natural lighting represent an important step in the development of modern painting. ... his work embodies some of the most important advances in Western realistic art. His paintings inspired Leonardo, Michelangelo and Raphael, and his artistic innovations contributed to a new way of looking at the world that gave birth to the Scientific Revolution."